Arrival in Bangkok is like jumping into a swimming pool; you go in and under and the city is all over you; welcome to Thailand! After getting to the hotel, take a moment to relax before a leisurely introduction starts. Bangkok, like most Thai cities, was built around canals and rivers and the best preserved neighborhoods are still right there, on the water’s edge. Your hotel in Bangkok could be beautifully located on Chao Praya river. Discover Bangkok in style with your own expert guide and private car to calmly find your way from highlight to highlight. You will learn of the history of the City Pillar on Ratchanakosin island where Bangkok was founded, enter the always bustling Wat Po; home to the 45 meter long Reclining Buddha and the perfect place to make your offering for your wish to be granted. Continue to the Grand Palace, Thailand’s most important landmark, where you will be awed by the grandeur and majesty of the building and its throne halls. Marvel at the sea of flowers on the orchid market where house wives come pick the best flower to put on their family-alter at home. In the afternoon, start exploring Bangkok in different mode of boat. By boat you explore Chao Phraya River and the lesser known canals and slide through these quite, green places where local families still live like in the past. 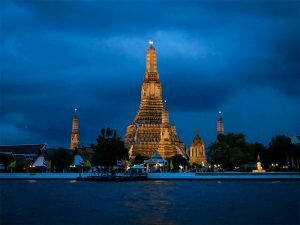 That feeling continues in Wat Arun, ‘the Temple of Dawn’ which you can climb to have a great to enjoy the view across the river and of course the majestic Grand Palace; a glistering spectacle of color and the most photographed sight of Bangkok. After that, you will climb up into sky on Golden Mount Wat Saket. Explore the lanes and stalls of China Town, full of smells and colors, traditional products and Chinese temples. Hidden in a street market across the river you discover a set of rusty train tracks. You join the locals and their merchandise of chickens, vegetables and gold fish in plastic bags to find out where they lead to. You will bump along the rails between the houses of people who seem to live right on the tracks and stop at every station there is. The scenery becomes greener and the air smells like salt; you reach the Gulf of Thailand and disembark right into one of the country’s biggest fish markets! Enormous shrimp, bright red lobsters, tons of squid and big, big fish actually caught in Burmese waters. No tourists here, people go about their daily affairs and smile at us, posing for your camera. This is a delta area, criss-crossed by canals, highly fertile and full of coconut plantations and fruit orchards. Green and wet. By boat we navigate narrow canals and enter the floating market of Damnoen Saduak, where old ladies sell noodle soup, pomelo, rambutan and other colorful fruit and of course souvenirs from their little wooden boats. Take a moment to step behind the souvenirs stalls to discover wooden houses and bridges still lining the waterways from the past. 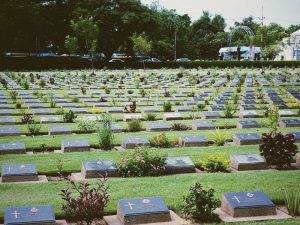 Dark side of history comes to life in the Museum and war-cemetery in Kanchanaburi on the river Kwai. A chance to learn about the hardships of the prisoners before walking across the notorious railway bridge is part of your program. Enjoy a cold beer at a riverside bar after a day filled with fantastic impressions! Make a leisurely start this morning before driving into the central plains which are filled with sugar cane or corn depending on the season. Trucks are piled up high and workers ride on top of them. Make sure to ask for a stop and taste a refreshing freshly pressed sugar cane juice. 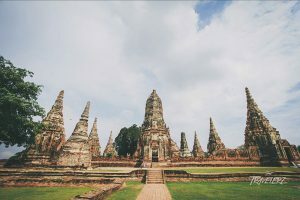 Arrive in the former royal capital of Ayutthaya, where Unesco declared the ruins of temples and surrounding structures a world heritage site. Wat Chai Wattanaram is particularly beautiful and was built in the same style as the famous temples in Angkor, Cambodia. Your guide transforms the ruins into their former glory when explaining what happened when the Burmese army sacked and destroyed the place, taking away all the gold once covering the temples to Burma. After this begins your journey miles up north to in another world, by a short flight from Bangkok to Chiang Mai. Chiang Mai has two sides; the city and the province. You will start by exploring the south of the province, the historical towns of Lampang and Lamphun. Lampang which feels more like a provincial town then a city, especially along the river in the center where the low-rise wooden houses dominate. The back streets and Don Tao temple which once held the Emerald Buddha. Take a horse cart to see the city. In the south where rivers full of clay are abundant, you visited temples made out of brick. Here in the north the supply of wood determines how houses and temples are built and a fine example of a teak wooden house in Ban Sao Nak. A temple busy with pilgrims is the Lanna-style Wat Pha That Lampang Luang. Lamphun is a sleepy little place built around the beautiful and small Wat hariphunchai, which is a fine example of Lanna-style northern architecture. The region around Chiang Mai is famous for traditions and creativity. Combine these and you will see beautifully crafted painted umbrellas, carvings and silk weavings. San Khampaeng Village is a major centre for traditional handmade products in Northern Thailand. This is the perfect spot to bring original and authentic souvenirs back home. “Mae Sa Elephant Camp” which is home to one of the largest assembly of elephants in northern Thailand. The philosophy of the camp is to create a natural and healthy environment for the elephants while working to conserve and breed them, due to the dwindling number of Asian elephants left in the wild. You will get to see trained elephants demonstrating their formidable and valuable forestry skills, taking a bath and you could optionally experience a jungle tour on elephant’s back. Stop for having lunch at local restaurant. In the afternoon, overlooking Chiang Mai is Doi Suthep and its golden pagoda. Driving up the winding forest road, but the last bit you do on foot on a long staircase framed by multi headed snakes. The temple is a beauty and always buzzing with religious activities. Make sure to walk around the chedi in clock-wise direction and burn your incense sticks for good travels in the next part of your trip. Then, enjoy a spectacular view over Chiang Mai and the surrounding area. Exploring the centre and its maze of lanes and alleys dotted with temples is best done on foot. The northern style is a feast for the eye and camera. Tonight you should browse the night bazaar in Chiang Mai by your own free time, famous for all kinds of souvenirs and many different flavors of local food; a perfect last evening! Leisure until your transfer to the local airport or train station. From here you could either travel onwards to the (beach) destination of your choice, or go home with a suitcase full of memories.